Hornady’s Extreme Terminal Performance 9mm Luger ammo, better known as XTP, is held in high esteem by competitors, law enforcement, and multiple government agents all over the country. It is so widely regarded as a top of the line self-defense cartridge due to its consistent and devastating performance. 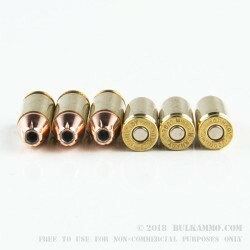 The part of this round that is the most recognizable is the hollow point bullet design that is evenly cast into 6 sectors. So, when the XTP load comes into contact with soft tissue of any sort, the hollow point begins to mushroom, the copper jacket petals of the 6 sectors start to and continue to fold back, and it spreads out into a "star" or "gear" type of shape. This performance, in addition to the stopping power, is yet another reason why it's such a popular design for many Concealed Handgun Licensees. 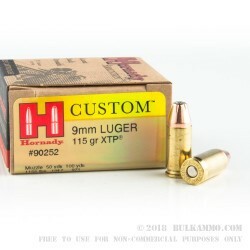 Hornady's 9mm Luger 115 grain XTP (Extreme Terminal Performance) rounds are loaded into a new, heavy-duty, reloadable, thick wall, non-corrosive Boxer primed, yellow brass shells. The muzzle energy these rounds produce reports a hefty 341-foot pounds, and they also have a great muzzle velocity of 1155-feet per second. 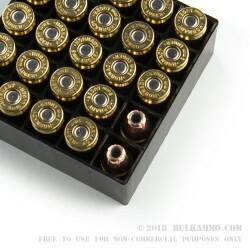 These rounds come in the larger volume 25 round boxes that are an ideal choice to take to the range. And with 10 boxes per 250 round case, these loads are great for self-defense training classes, or any shooting competition. Get your Hornady XTP Custom 9mm ammo today, and you'll be ready for your next class.